“Our generation sees in him that rare blend, that light of Torah, righteousness, kindness and truth that few people merit.” This is how one of our generation’s leaders described Rabbi Avraham Pam. For sixty-three years, he taught Gemara and Halachah, but he taught more. He taught — and demonstrated in his personal life — how to bring glory to Hashem and His Torah. He taught his students to be men of integrity; caring, thoughtful people, whose words heal and never hurt. Rav Pam shunned the limelight. He preferred to devote his days and nights to his life’s passion; the study and teaching of Torah. But when Heaven decreed otherwise, he accepted leadership reluctantly, regretfully — and with a sense of responsibility that did not waver until his last breath. In this warm, riveting, comprehensive biography, you will meet a man to whom, scores streamed for counsel and blessing, whose countenance radiated purity and whose humility masked a clear, decisive viewpoint that rang with Torah truth. 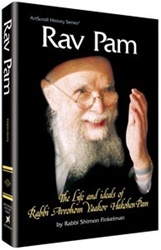 The author, Rabbi Shimon Finkelman, knew Rav Pam, his soul, and his milieu — and it shows clearly in this loving, accurate, and inspiring portrait of a very great man. This is a book that must be read. And then it should be read again and again, so that the image of Rav Pam will remain fresh in our minds and light the way for us and our children.